Long Live Evil! Descendants 2 coming to Disney Channel Summer 2017. 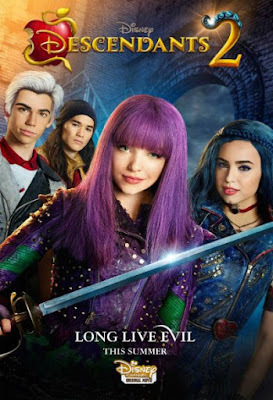 It is the highly anticipated sequel to “Descendants,” the No. 1 cable television movie of 2015 and the fifth highest-rated original movie ever on U.S. cable TV in Total Viewers. It is also the No. 1 Disney Channel Original Movie ever among kids in France, Netherlands, Belgium (south), Portugal, South Africa and Spain. In Italy, it is the No. 1 Disney Channel Original Movie ever among girls. Emmy Award-winning director Kenny Ortega (“Descendants,” “High School Musical” movies, 2016′s “The Rocky Horror Picture Show”) will return as director, executive producer and choreographer. Dove Cameron (“Liv and Maddie”), Cameron Boyce (“Gamer’s Guide to Pretty Much Everything,” “Jessie”), Booboo Stewart (“X-Men Days of Future Past”), Sofia Carson (“Adventures in Babysitting”) and Mitchell Hope will reprise their starring roles as Mal, Carlos, Jay, Evie and King Ben, respectively. China Anne McClain (“A.N.T. Farm”) will join the cast as Uma, the daughter of Ursula from “The Little Mermaid.” Casting will be announced soon for additional new characters including the progeny of villains Captain Hook and Gaston. Lauded writers Sara Parriott and Josann McGibbon (“The Starter Wife,” “Runaway Bride”), who won a 2016 Writers Guild Award for “Descendants,” wrote “Descendants 2” and will also executive-produce with Wendy Japhet (“Descendants,” “An Education”, “The Italian Job”). “Descendants” costume designer Kara Saun (“Project Runway”) and production designer Mark Hofeling (“Teen Beach Movie,” “High School Musical”) are also signed on for the sequel. Tony Testa (“The Rocky Horror Picture Show,” “This Is It”) will join the creative team as choreographer with Ortega, and Shawn Williamson (“Adventures in Babysitting”) will join as producer.